Sports super channel ESPN, U.S. Senator Ted Kennedy and his family, and thousands of other guests have turned to Holiday Expeditions to take them into the wilderness for great adventures and unforgettable experiences. Why? 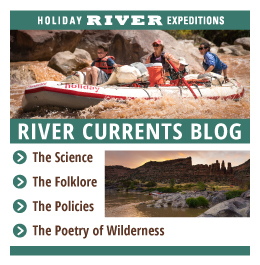 Because over the past four decades Holiday Expeditions has earned a solid reputation as an experienced outfitter navigating some of the most spectacular whitewater rivers in Utah, Colorado and Idaho and offering uncompromising service on the river, trail or at camp. And, under founders Dee and Sue Holladay, the company has become an industry leader when it comes to environmentally-sensitive river rafting, mountain biking, horseback riding and sea kayaking trips. It is the goal of Holiday River Expeditions to preserve our nation’ wild lands. Holiday will provide our guests a safe and enjoyable wilderness experience with an opportunity to learn about the natural world, and through this awareness encourage the preservation of wild places and cultural treasures. We will accomplish this through: Diligent Training; Meaningful Interpretation; Innovative Equipment & Facilities; Responsible Stewardship of the Land; and Environmentally Sound Business Practice. First and foremost, Holiday does what is beneficial to the natural resources, not necessarily what is profitable for business. This commitment to the environment and providing guests with the finest wilderness experience has helped Holiday grow into one of the most popular and respected outfitters in the West. The Holladay’s stumbled upon their fun-filled way of life in 1960 when Dee was invited by a friend to make a trip down the Yampa River in Dinosaur National Monument. “I went on the river trip, liked it and just kind of kept coming back,” Dee says while explaining his love for whitewater that still keeps the 69-year-old running rapids up to 60 days a year. 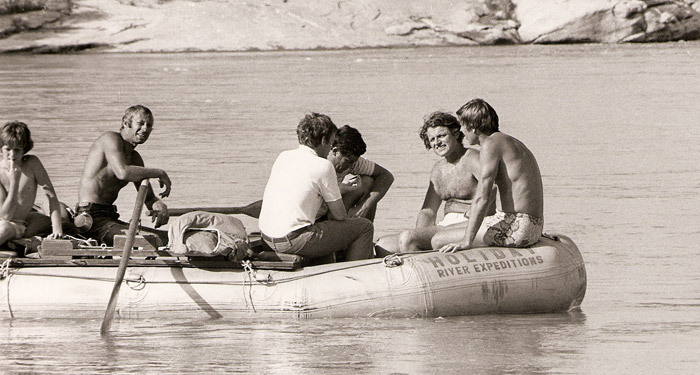 Six years later, in 1966, Dee realized others would gladly pay to share the excitement that builds as your raft pitches and rolls its way through frothy whitewater. So he launched his company that year, taking paying customers on weekend trips and during vacations from his job as an auto mechanic in Salt Lake City. In the back of his mind, Dee was quietly planning to make the business full-time. The Holladay’s big break (literally) came during the winter of ‘72-’73 when Dee was laid up and unable to work because of two broken legs suffered in a skiing accident. 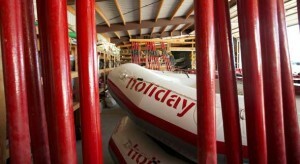 After the Holladay’s survived the winter on Dee’s guiding income from the previous summer, the couple knew they could make a go of a full-time river-running business. Since making that decision, the Holladays have built one of the finest whitewater rafting companies in the nation – one known for its seasoned guides, strong environmental tenets and innovative solutions to common problems. 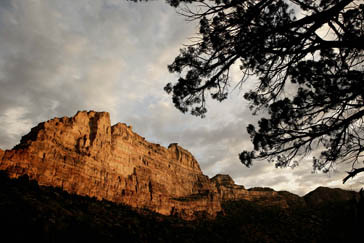 And, one that is now becoming equally well-known for its mountain bike treks through Utah’s famed slick-rock country and excursions to a century-old working cattle ranch. Sunrise dawns quietly on the river. The water ripples by your campsite, silent but for the dull roar coming from the rapid down around the bend. The aroma of “Cowboy coffee”, bacon and flapjacks hangs invitingly on the air, coaxing you out of your tent, eager to spend another day on the river. It’s a scene Dee and Sue Holladay have relived countless times during the four decades they’ve spent on rivers like the Green, Colorado and Salmon. And it’s a scene they’ve treated thousands of guests to with the help of some of the best river guides in the business. Guides who not only know every bend and rapid in the rivers they run, but who also are skilled in backcountry first aid and river-side culinary wizardry. “The guides today go through extensive training. I was qualified to be a boatman (in the 1960’s) just because I had been on a couple of river trips,” Dee says, noting how times have changed. Guides need at least three river trips just to gain an apprenticeship and then must pass a state licensing test. On top of those requirements, Dee has adopted his own stringent training program that stresses wilderness first aid, river safety and rescue, food handling and interpretation skills. Once on the river, guides go out of their way to protect the environment in manners pioneered or perfected by the Holladays. Engines that could foul the water with gasoline or oil, and which reverberate noisily through the canyons, aren’t allowed. Campfires are built on metal fire pans elevated over ceramic fire blankets that keep the sand and vegetation from being scorched or baked. All garbage and human waste is packed off the river – trash is recycled or disposed of in landfills; human waste goes to municipal treatment plants. On some trips, Holiday even packs firewood down the river for campfires. Such practices, perhaps new to some other outfitters, have long been standard for Holiday Expeditions. And the company’s guides are just as environmentally sensitive away from the river. They know you have to tread carefully on hikes as many of the soils along the Southwest’s rivers have cryptobiotic crusts – nitrogen-rich soils that are home to bacteria and lichen, and take 50 years to establish, yet can be destroyed by one footstep. Whether your interest lies in raging whitewater, mountain biking through stunning alpine terrain, learning more about the natural and human history of the West, or combining several adventures into one vacation, Holiday River Expeditions can satisfy your hunger. For decades Holiday’s expertise has been sought by people from all walks of life: family groups that strengthen their bonds while bucking the whitewater; business groups looking for a team-building experience; singles looking for a relaxing party; and those who hit mid-life in full stride and want to get back to the outdoors to learn more about geology, natural history and themselves. Today they continue to offer a variety of trips founded on excellent service, a reverence for the environment and a love of being out in the open and sharing it with others.